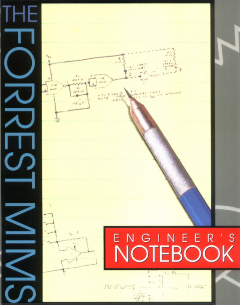 Back in the halcyon days of electronics publishing (aka the mid-1970s), the venerable Forrest M. Mims III printed a complex circuit in one of his notebooks that is an ideal pumpkin stuffer. The “back and forth flasher” circuit was based on the powerful combination of a 74154 4-line to 16-line decoder IC and a 74193 4-bit up-down counter IC. When properly built and installed inside a pumpkin, the results can be, as described by Mims, “visually appealing.” If you’d like to try your hand at building this circuit, but can’t find a vintage Mims notebook, Tony van Roon has reprinted this circuit online. And any intrepid experimenters who have photos of this circuit, please post your pics links in our comments section. Thanks for publishing a note about my back-and-forth flasher circuit. I still have it, and it still works!